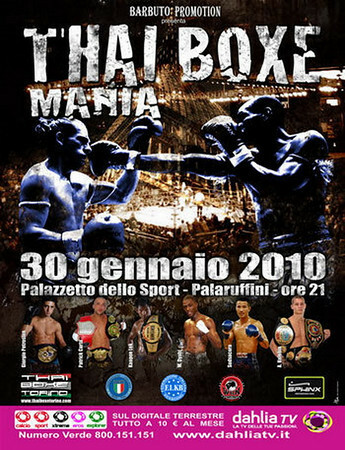 The Barbuto promoted Thai Boxe Mania has ended and the results are in. Despite the name most of the fights were apparently under Fight Code rules similar to K-1. The January 29th, 2011 event met or exceeded promoters’ expectations and has some 23 networked broadcast partners throughout southern Europe. Reportedly attendance was quick to meet the capacity 4000 seats and all fighters were paid in advance. Giorgio Petrosyan VS Sudsakorn Klinmee in Fight Code rules: Petrosyan wins by point victory. It should be noted Sudsakorn is 2 weeks out from fighting Kem Sitsongpeenong. Constantinov Serebrennikov VS Abdallah Mabel in Fight Code rules: Mabel wins by point victory. Armen Petrosyan VS Miodrag Olar: Petrosyan wins by point victory. Sak Kaoponlek VS Andrei Kulebin: Kaoponlek wins by point victory. The original opponent for Giorgio Petrosyan was to be Yohan Lidon but Lidon is apparently naturally to large to make the 70kg weight limit any longer. The other substitution was for Fabio Pinca who apparently had prior commitments to honor and could not appear. ~ by fatsoking on January 30, 2011.